Submitted by sanjay on Thu, 11 Oct 2018 - 04:37 pm. In commemoration of the Diamond Jubilee there was a special Reunion at Vidyapith on 6th and 7th of October'2018. Y. Kotishwar Singh, ex student of 1978 Batch and presently Chief Justice of Imphal High Court was the Chief Guest in the inaugural function at Sabha Bedi on 6th October'2018. 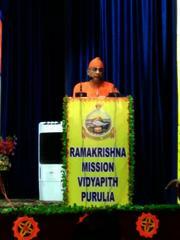 Along with him was Dr Dhruba Marjit, ex President of the Alumni Association, Swami Sivapradanandaji Maharaj(Saikatesh da), Swami Dheyananandaji Maharaj and Swami Balabhadranandaji Maharaj, Assistant General Secretary, Ramakrishna Math and Mission. 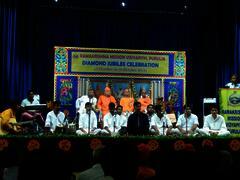 The speech of Saikatesh Maharaj in the function deserved special kudos from the audience present therein. In the evening, there was a performance of Saxophone by Sri Michael Banerjee which mesmerized the audience. The next day found Sri Debanjan Chakraborty(1990 Batch), Director, British Council, Kolkata, Sri Supratik Pal(1994 Batch), presently at ISI, Baranagar and Sri Tamal Bandyopadhyay(1997 Batch) , presently at Ramananda College, Bishnupur as the speakers in a motivational session by the Ex students before the present one. More than 150 Ex students joined the Reunion which was organised by the Vidyapith authorities. The Association extends its heartiest gratitude to the Vidyapith authorities for their tremendous hospitality and warmth shown to the ex students.